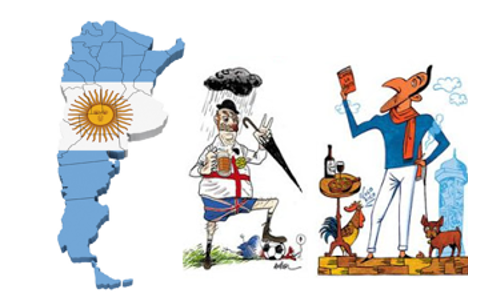 The Collective Argentinian – Between Europe and Arrogance? Argentina! Take Spanish passion, Italian emotion, the architecture and arrogance of the French, the etiquette and sports of the British and over time you will get Argentina with its meat eating, mate drinking and tango dancing people! Often Argentina is reduced to superficial definitions like this. Often people try to explain the collective Argentinian by focusing too much on its European immigration rather than on the Argentinian history itself. A history full of political and economic extremes and an Argentinian culture which has been shaped by this eventful and ongoing journey. Although this culture was heavily influenced by European immigration, Argentinian history was written on Argentinian soil by Argentinian people. Each single era delivered its input for the development of the Argentinian culture and identity. Today the Argentinian self-perception of their culture is likely to differ from the perception from an outsider, like mine. In any case, the collective Argentinian has his justified or unjustified stereotypes. In order to evaluate to what extent these stereotypes are true, it is necessary to look how they have emerged. It is necessary to understand Argentinian history! 200! This year Argentina will celebrate its 200th birthday. More precisely, it was the 9th of July 1816 when the congress of Tucumán declared independence from Spanish authority and send Argentina on its way. An exciting journey has begun, characterized by civil wars at the beginning and an increasing European immigration. Incrementally Argentina became a magnet for European immigrants, which reached its peak in the early 20th century. Hundred thousands of people arrived in the new world, looking for a better future. A rapid growth in population and economy was the result. In 1914 half of the population was foreign-born. It was the golden era in Argentinian history, a time full of prosperity, wealth and progress. Argentina was ranked among the ten richest countries in the world, ahead of France or Germany, and “As rich as an Argentine” became an international catch phrase. Its surrounded countries were struggling and it seemed that Argentina has created a long-term advantage in South America. The country paraded its achievements and new born pride around the continent and started looking down on its neighbours. It was the time when the Nicaraguan poet Rubén Darío predicted that Argentina will become the guiding force in Latin America with an exemplary economic and political model (Nouzeilles, G & Montaldo, G, 2002, p206). But that was not what happened! Soon a time full of political and economic instability began. The second part of the 20th century was characterized by a succession of authoritarian regimes, military coups, and times of economic crises. After World War II the former officer Juan Perón seized power. An era which will be remembered as one of the most controversial chapters in Argentinian history. His Peronism a composition of fascistic ideas, promotion of industrialisation and social polices represented an alternative ideology to the extremes of capitalism and communism. After a putsch in 1955 he went into exile and returned in 1973 to start his second presidency. Soon after his dead in 1974 a new military regime seized power which ended in 1983. Democracy returned to Argentina, but more than 30 years later it still has not led to stability. Loose economic policies in the 1980s, the hyperinflation in 1989-90, the economic crisis in 2001 and another leftist presidency of Néstor Kirchner and later his widow Cristina Fernández de Kirchner acted as barriers for strongly needed reforms. 2015 the hope for change has returned to Argentinian society when the centre-right opposition challenger Mauricio Macri was elected for the new president. This was 200 years of Argentinian history, 200 years of Argentinian cultural development and also the time when Argentinian stereotypes emerged. Stereotype 1: Argentinians think they are European! Europe! The questions of the Argentinian identity and their relationship to Europe was prevailing and omnipresent for a long time. In 1910 the Argentinian Intellectual Victoria Ocampo already mentioned “When in Argentina, we feel European, when in Europe, as Argentinians—we always feel like strangers.” (Levey, Ozarow, Wylde, 2014, pXV). Often Argentina is still understood as a nation of European immigrants and their descendants, with Buenos Aires as the Paris of South America (Schneider, A, 2006, p6). It is beyond doubt that European immigration was a driving force in the Argentinian development. Over time a European heritage has been created which today is implemented in the Argentinian culture. But what is exactly meant by the European heritage and how prevalent is it today? When the massive European immigration waves arrived in Argentina Europe was not a single empire, but rather a cultural and political diverse continent with many different countries. Every single nation of immigrants brought its own culture, costumes and peculiarities, which with the time gave rise to a new Argentinean culture. The Spaniards, the fathers of Argentina, brought above all the Spanish language. With the Italians, the biggest group of immigrants, the Italian spirit and lifestyle arrived in the ports of Buenos Aires. The British brought among other things sports, like Polo or Football, which are today essential parts of the Argentinian culture. And when you walk around Buenos Aires you can’t overlook the French architecture in the beauty of its buildings. Furthermore, the Argentinian elite favoured over a considerable historical period to import European models of culture, literature and arts over natives or other Latin Americans (Schneider, A, 2006, p2). 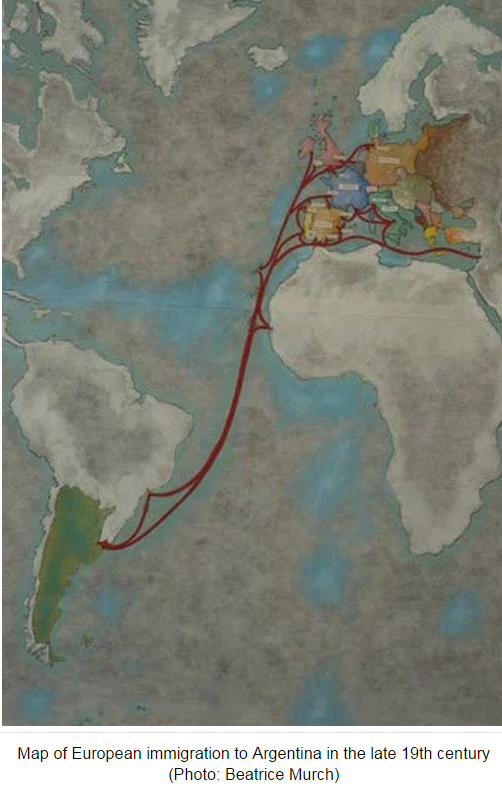 Argentina strived to be international and modern and Europe was considered as the right paradigm. This is probably the time the stereotype “Argentinians think they are European” has its roots. The time during and after the massive immigration when the European existence was definitely more prevalent than today. But times have changed, immigration decreased and Argentina had to face new challenges. Hence the relationship to Europe declined, but the Argentinian identity continued, shaped by its controversial history. A history which often forgets about the indigenous population, about the people who have been on the continent a long time before the arrival of the Europeans. With the Europeans the demise of their pre-Columbian cultures began. First the Spaniards and later Argentina itself pursed a non-tolerance-policy against indigenous cultures. White and European blood were superior and so an adequate implementation of indigenous cultures in the Argentine-ness never have happened (Richey, J, 2007, p8). According to Amnesty International, indigenous people in Argentina are still facing intimidation and discrimination of their human rights. In a nutshell, while the European immigrants shaped the Argentinian culture for a long time, indigenous cultures were largely ignored. When I was in Argentina in 2014 I got to know a country and especially its capital Buenos Aires with a cosmopolitan spirit. People who feel “European” were rare and often belonged to the middle-upper class of Buenos Aires. Those were people who mentioned their European backgrounds before their names when they introduced themselves. Nevertheless, the average Argentinian is a very family-oriented person and therefore they are likely to have a relationship to the country of origin of their ancestors, but not to Europe in specific. A relationship that fades generation by generation. The mass immigration lies in the past and other historical events and new generations of people have influenced the Argentinian identity. Considering all these points, I don’t think that the collective Argentinian thinks he is European. Not anymore! Stereotype 2: Argentinians are arrogant! Arrogance! When even Pope Francis makes jokes about the arrogance of his fellow citizens and Google claims the same, there must be a reason for it. This Arrogance can have various reasons, such as excessive pride, fear or insecurity. As already mentioned, the roots of the Argentinian pride lie in the golden era of the early 20th century. It never got better than this. It was the time Argentina looked down the nose to the rest of Latin America, letting no doubt who has the hegemony on the continent. Argentina was better, whiter and more sophisticated. The Argentinian pride and arrogance was born. But little by little Argentina’s neighbour countries grew and the competition in South America emerged. The prestige of Argentina declined. This demise has left scars in the Argentinian culture and their pride probably got wounded, although the Argentinians are not likely to admit this. Their own ego is still huge. After my stay in Argentina I have drawn my own conclusion about the stereotype of their arrogance. The Argentinians I got to know are people with a low level of self-mockery, they always want to have the last word and it is easy to make them furious. Two things better not to say to an Argentine is that Chile has better wine or Brazil is better in football. I think that they probably know that they are not the country anymore they aspire to be, the country they remember, or the country they have heard from their ancestors. But what they don’t know is their own history, at least not sufficiently. Besides the relation to pride the Argentinian arrogance potentially has a correlation to subconscious insecurity. According to the book “Freud in the Pampas” by Mariano Bet Plotkin Argentina has one of the world highest numbers of psychoanalysts and Argentinians regularly lie down on the therapy couch. From a psychoanalytic perspective he mentions that psychoanalysis provides security to changing societies undergoing a crisis (Plotkin, M, 2001, p5). Crises Argentina has faced in recent history due to ever-changing political and economic circumstances. They couldn’t even trust their own currency, the Argentinian Peso. It is beyond doubt that this had impacts on the Argentinian society, especially on the middle-class. Consequently people were looking for security which the state itself could not offer. Doubts if or to what extent this can be linked to the high demand for psychoanalytic therapies and subsequently to the Argentinian arrogance is more than justified. Certainly there are several other reasons for the high demand of psychoanalytic therapies. One reason, I think, is their general open emotional expression, which makes psychoanalytical therapies socially more acceptable. I know a case where a whole family underwent therapy to deal with their emotional problems. I was extremely surprised by their openness about it, because it was something I did not know from Europe. Although the reasons for psychoanalytic therapy are mostly individual, a correlation of continuously historical crises which over time potentially created a collective subconscious insecurity and so shaped the Argentinian arrogance, as a tool of self-protection, can’t be totally disregarded. In conclusion, for me the Argentinian is indeed a complex phenomenon who often acts arrogant. European immigration, an eventful and controversial history and a lack of its clarification had a deep influence on the Argentinian culture and identity. That the collective Argentinian maybe neither feels European nor Latin American doesn’t matter. For me there is no need for categorizing and put them in “in-between” categories. As I said at the beginning, cultural identity is not pre-given but rather an ongoing journey. The next step for Argentina would be the clarification of its own history. Nouzeilles, G and Montaldo, G (2002) The Argentina Reader: History, Culture, Politics, Duke University Press, Durham and London. Plotkin, M (2001) Freud in the Pampas: The emergence and Development of a Psychoanalytic Culture in Argentina, Stanford University Press, Stanford, California. Schneider, A (2006) Appropriation as practice: Art and Identity in Argentina, Palgrave Macmillan, Hampshire, England. Levey, C and Ozarow, D and Wylde, C (2014) Argenina Since the 2001 Crisis: Recovering the Past, Reclaiming the Future, Palgrave Macmillan, New York, United States. Richey, J (2007) White Mestizaje: Soccer and the Construction of Argentine Identity, 1924-1930, University of North Carolina, Chapel Hill, United States.